Let's assume your first taste of South Uist is as you come across the causeway from Eriskay after disembarking from the Sound of Barra Ferry. As you travel north along the B888 towards Lochboisdale your attention is suddenly caught by what seems to be an oddly shaped, large concrete block to the east of the road. 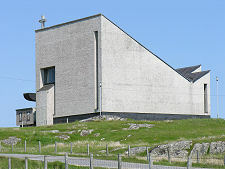 In the wide open landscape of southern South Uist your natural tendency is to see this as smaller that it actually is: but as you near it, the true scale and impact of Our Lady of Sorrows Catholic Church becomes clear. 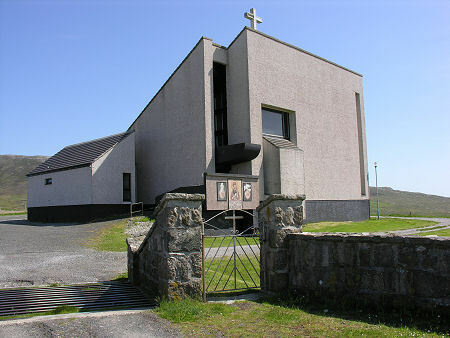 If the church seems imposing and incongruous today, imagine how much more so it must have seemed when built in 1965 by architect Richard McCarron. 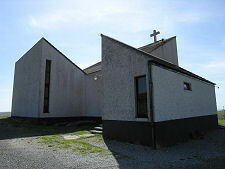 The "Buildings of Scotland" series describes Our Lady of Sorrows as "brutalist". It certainly owes little to traditional Western Isles building styles, but if you think of it as a work of sculpture as much a building, it does have a certain charm. 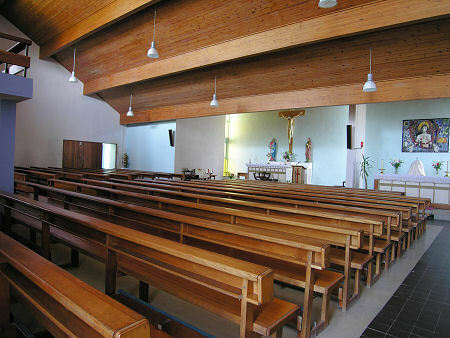 It is particularly interesting to see how the differently pitched roofs change the outline of the church as you view it from different angles. 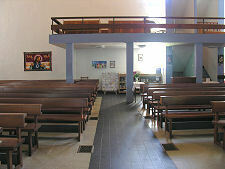 The steeply pitched main roof is, inevitably, reflected in the interior design, which focuses attention on the broad east end of the church. 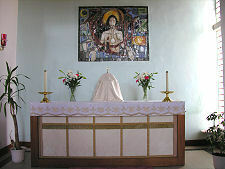 Here the a main altar is surmounted by a cross, while the Blessed Sacrament Altar stand beneath a marvellous ceramic by David Harding. 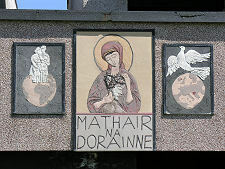 Outside the church, the stark frontage is relieved by the vertical windows above the door, and by a mural below it, reflecting the sorrows of the contemporary world. This was produced in 1994 by Michael Gilfeddar. 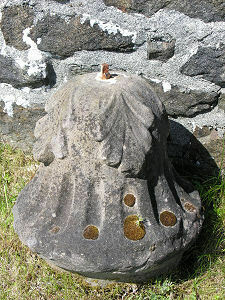 Also outside the church, behind the wall separating it from the road, is a single bell-shaped piece of old stonework looking as if it once formed part of a heavily carved column. A relic of an earlier church on this site?